Snow and Hawaii are two words many would not expect to hear in the same sentence, but it has been snowing there since Monday. According to The Weather Channel website, snow is falling and is anticipated to cover the volcanic summits of Hawaii’s Big Island up until at least Wednesday morning. “Temperatures have fluctuated near the freezing mark over the Big Island summits, where a mix of snow and rain is occurring, along with gusty winds,” said the website. Outside of Big Island’s volcanic peaks, other parts of America’s 50th state have been experiencing heavy rainfall with 6 inches being recorded on parts of the Big Island and Maui from Monday into Tuesday afternoon. The snowfall on the volcanic peaks prompted the National Weather Service to issue winter storm warnings. The NWS issued advisories for areas where up to 2 inches of additional snow is expected, leading to localized storm totals up to 6 inches, said The Weather Channel. NWS also issued warnings about flash floods, and days just before that wind gust advisories. Due to the snow and ice conditions, summit roadways have been closed for safety reasons. Watch this Hawaii247com video taken when there was more than 6 inches of snow above the 12,000-foot elevation of Mauna Kea in December of 2010. “The heavy rain and snow are present because of strong easterly trade winds and a disturbance in the region,” said the website. While it may seem an odd phenomenon to some, snowfall in Hawaii is not unusual. “It snows here every year, but only at the summits of the highest volcanoes on the Big Island – Mauna Loa and Mauna Kea – which are at an elevation above 13,000 feet, as well as Haleakala on the island of Maui, which is at an elevation of just over 10,000 feet,” said the site. The website said that the current wet conditions should continue through the week but with temperatures increasing mid-week the snowfall shall cease. 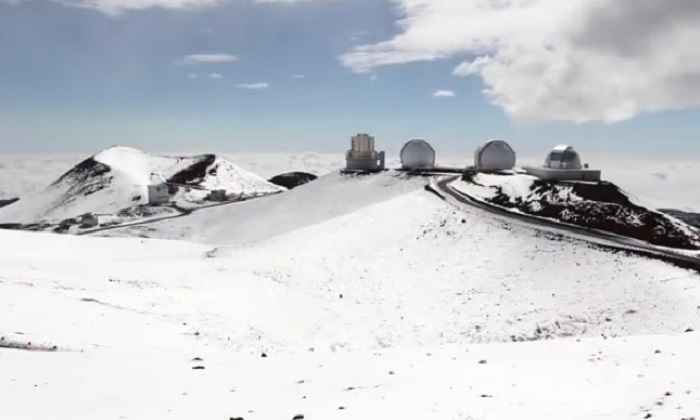 Watch this Hawaii247com video for more footage of snow covering Mauna Kea taken in mid-2011. Think your friends may not know about this? Share it on Facebook and you will help keep them up to date and help us earn the ad revenue we need to keep reporting. Thank you!